What Makes a Quality After School Program? Why Is Gym Important in Middle School? Middle school PE helps build physical skills. It may seem like all games, but PE class is more than kicking balls and running laps. The gym teacher plans the units and daily lessons based on specific goals and projected outcomes. 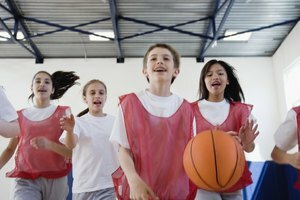 PE benefits your middle school child beyond just the physical aspects, even if she dreads sweating next to her crush and showering in the locker room. By middle school, students understand basic movement and possess physical skills, including gross and fine motor skills, such as grasping. The physical skill goals for middle school become more in-depth, building on the physical skills and activities learned in elementary school. According to the Centers for Disease Control and Prevention, middle school students should use skills needed for specialized sports, gymnastics and dance. Along with actually performing the skills, the middle school PE program should teach the concepts and strategies behind the physical skills. The games and activities in the PE curriculum often involve teamwork. Middle school students learn to work together for a common goal, such as hitting the volleyball over the net or scoring a goal during hockey. Working together requires the students to communicate to come up with a plan or strategy. At the middle school level, cooperative learning encourages preteens to become more independent. When conflicts arise, the middle school students practice conflict resolution to solve the issues themselves. The National Association for Sport and Physical Education lists improving and maintaining physical fitness to benefit overall health as a PE standard. The regular activity in class should condition middle school students to handle vigorous activity. Participation improves endurance, strength and flexibility. Students often learn how to use heart rate monitors to exercise within a safe and beneficial heart rate range. PE class may help students maintain a healthy weight to avoid obesity in the future with the regular physical activity. A nutrition element taught through a health education class reinforces the components needed for overall health, according to the CDC. Middle school students still rely on their parents, but they are learning self-care skills that will last into adulthood. The middle school physical education program should aim to teach overall wellness that creates a healthier lifestyle for the students. The class itself allows for regular physical activity during the school day. A quality middle school PE program encourages participants to find value and enjoyment in physical activity throughout life. Physical education often incorporates nutrition and safety concepts that support physical activity for overall wellness. Frost, Shelley. "Physical Education Aims & Goals for Middle School Students." Synonym, https://classroom.synonym.com/physical-education-aims-goals-middle-school-students-5365.html. 26 September 2017.